We're finding that this damp and warm spring is producing a bonanza of oysters. And, what better way to feature them than in Chef John Ash's delightful salad preparation! Often referred to as the "Father of Wine Country Cooking", Chef Ash has been a part of the American culinary scene for many years, winning awards, authoring cook books (His latest book, Culinary Birds, is scheduled to be published by Perseus Books in the fall of 2013. ), consulting with food processors, participating on the Board of Advisors of Seafood Watch at the Monterey Bay Aquarium, hosting radio and television shows on the Food Network, contributing to food magazines ... gosh, this man is busy! We found these lovely oysters down by the creek. ... according to a recent article in Oregon Business. 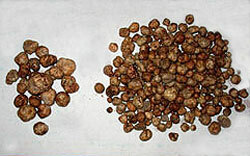 These are Curry County truffles. Spring came with a fury this year, bringing with it a surge of storms that dumped over 100" of rain in Port Orford in the first 3 months of 2012, 60 of it in March. Rain, rain, rain. 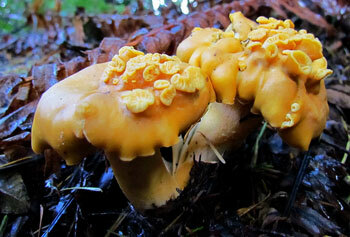 And the rains signaled an end to our fall/winter mushrooming forays. We picked the last of the hedgehogs at the end of April, and they were beauties: large, perfectly formed and flavorful. What a great way to end the season! And what a way to begin the spring season: picking picture-perfect oysters off fallen alders down by the creek. Thanks in no small part to the persistent rains, the oysters are fruiting in profusion! We loaded today's bounty into the dehydrator and will savor this batch of oysters in future soups and sauces. We donated chanterelles and matsutakes to the Wild Game Banquet this year. 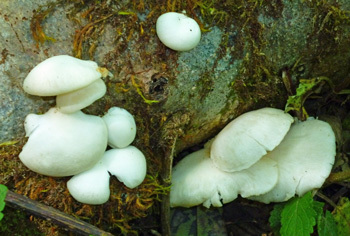 Troll caves are warm, dark, and often humid, and are therefore the perfect environment for the cultivation of mushrooms. 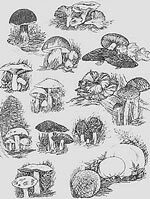 Trolls have nurtured and harvested mushrooms for as long as they can remember (which is quite a bit). Over the centuries, they've managed to increase the size of the mushrooms considerably, as well as controlling their texture and strengthening their pungent fungal flavours. 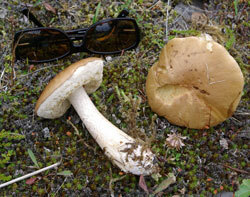 The largest varieties of mushrooms now have thick, tough skins that are as useful and hard wearing as leather. we're pretty sure the trolls had nothing to do with these particular examples. What Can You Do with Morel Print Fabric? What can you do with morel print fabric? 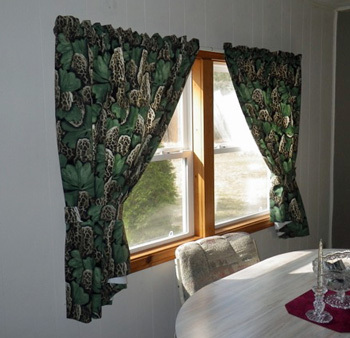 Well, it didn't take Jack and Annie Skrceny long to figure out that it would make perfect drapes. Check out their photographs below!